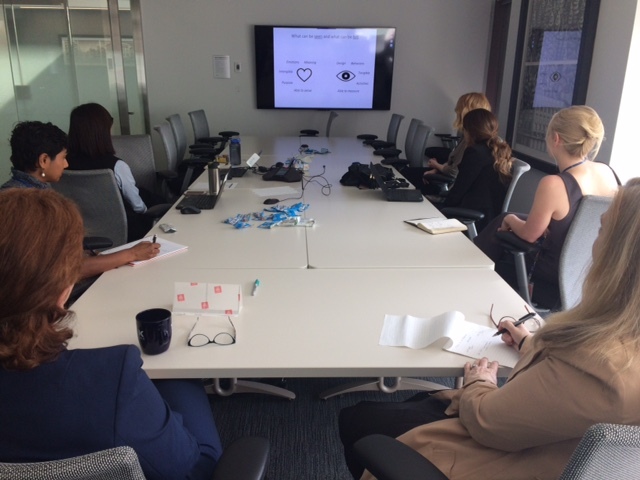 On May 8th, Kate Stern hosted the first of a new event series called ACMP Movie Time in-person at BC Hydro’s downtown office with some participants attending virtually. This new event series is focused on webinars and short media presentations where participants can relax and engage in a topic with a discussion immediately following the presentation to share key insights and learnings. This first session featured an ACMP Global Webinar: The Four Keys of Engaging All Personalities and Perspectives by presenter Joe Foster. Joe is a change management and IT professional with a passion for interpersonal and team effectiveness. Joe discussed how different viewpoints will lead to different perspectives, which he outlined in a grid model (see image). Taking it a step further, Joe outlined the attributes/characteristics of each quadrant and how best to address the needs of each perspective type in conversations and communications. Lastly, Joe offered one technique, known as GIFS, which can help in developing communications to ensure that you’ve addressed the needs of all four perspectives: Group, Individual, Feel, and See. For those that missed the webinar, it’s now available for playback under the Members-Only Webinars section of the ACMP Global Website. All perspective are true, but incomplete. It’s important to see things from other’s perspectives and not make decisions based on a narrow scope. Some cultures are more likely to have a perspective dominated by the “individual” and opposed to the “group”. We all have a default perspective (ME, IT, ITS, WE) but that doesn’t mean we are limited to that perspective. It’s also likely circumstantial (e.g. our perspective at work might be different from our perspective in our personal life). GIFS technique appears to be a useful tactical tool that many will employ. We’ve heard positive feedback about the event, particularly around the flexibility (i.e. ability to attend in-person or remotely). We look forward to hosting another Movie Time Event soon – check out our Event Page for the most up-to-date listing of our events!